The Shelby County KFTC Chapter raised more than $800 at its first Pie Auction September 18. About 30 people bid on 13 pies (including a cake and a cobbler), with winning bids ranging from $35 to $100. People also purchased KFTC shirts and hats and made direct donations. KFTC members and friends who contributed pies went to the effort of making two of each: one for auction and one for tasting before the bidding began. Goods included derby pie, chocolate pie, peach cobbler, Belgian butter cookie cake, chess pie, lemon meringue pie and others. 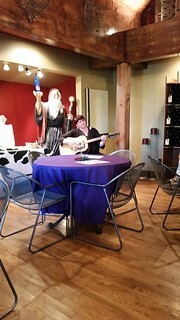 During the tasting, the talented Susi Wood entertained the crowd with live acoustic music. Music, food and new faces highlighted the second annual chapter meeting of Shelby County KFTC Chapter on June 19. More than 30 members and friends attended, including at least 10 who are new to chapter meetings. Almost half of the chapter’s 67 members were present to review the organization’s platform and to celebrate work accomplished over the past year, as well as to discuss work to come. The scene was energetic and welcoming at the unassuming Stratton Community Center in Shelbyville, where a delicious spread was bracketed by homemade pies. The pies fueled much conversation and inspiration for the group’s upcoming pie auction in September. 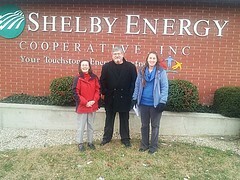 Shelby KFTC members addressed the Shelby Energy Rural Electric Co-op Board of Directors Nov. 25 and asked them to adopt a Members Board of Rights that guarantees fair elections, open meetings and open records. Although the board members did not respond to the request, Shelby KFTC members felt they made a positive impression on the Board. "They listened attentively but didn't ask a single question," Patrick King, a Shelby Energy member/owner said, noting that the board has had copies of the proposed Members Bill of Rights for more than a year. "The overall impression was not negative. I think we caught their attention in a couple places. I believe they were listening." 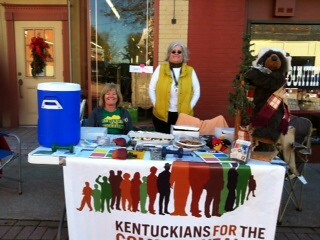 Shelby County KFTC members help Light Up Shelbyville! There's nothing like free sweets and warm drinks on a cool day to draw the crowd to your table. Shelby KFTC and Fairness Shelbyville offered cookies, brownies, cupcakes and hot cider at Light Up Shelbyville October 10. Refreshments gave us a chance to invite people to our monthly meeting; offer brochures and flyers about Kynect, reforming Shelby Energy, fighting the Bluegrass Pipeline and passing a Fairness Ordinance, and promote our Nov. 21 Chili Supper fundraiser. We introduced ourselves to a lot of people who did not know about us, distributed dozens of Kynect tote bags with flyers on signing up for insurance and gave membership and meeting information to a number of people who expressed interest in joining KFTC. It was our most successful tabling event to date, and we are looking forward to making the next one even better. Members Ann Ellerkamp, Jane Thomas, Leslie McBride and Lisa Aug provided refreshments, and Patrick King, Cynthia Dare and Chris Hartman provided materials and support.